Radiography is the use of ionizing electromagnetic radiation such as X-rays to view objects.Although not technically radiographic techniques,imaging modalities such as PET and MRI are sometimes grouped in radiography because the radiology department of hospitals handle all forms of imaging.Treatment using radiation is known as radiotherapy. X-ray photons are formed in events involving electrons and are the mainly form of ionizing electromagnetic radiation used in medical radiography.This radiation is much more energetic than the more familiar types such as radio waves and visible light.Proper production and detection of photons are important in the creation of good radiograms. X-ray radiation for medical imaging is typically produced by X-ray tubes,which operate through bombarding the anode with high energy electrons emitted from a hot cathode(the stream of electron with high speed interact to the target 'anode' from cathode due to this the generation of x-ray occur. 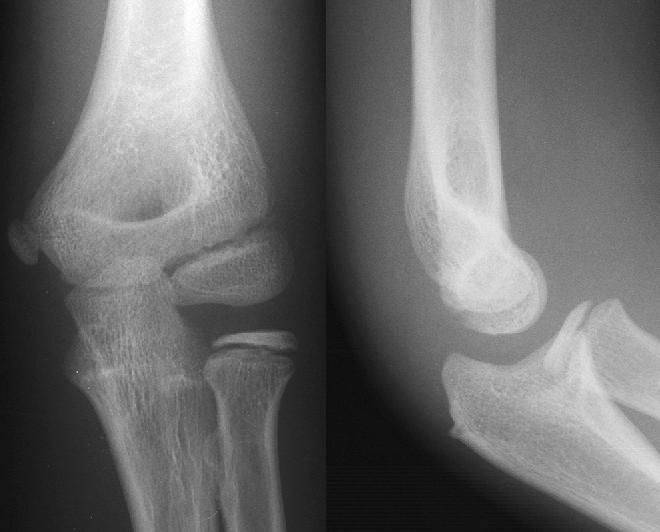 ).Image sharpness,contrast,and patient dosage are important considerations in medical radiography and these requirements determined the desired energies of the tube,the type of material used on the anode,and the method in which the power is generated to drive the tube.Although the technical definition of x-rays range from 1-700 keV,medical x-rays typically use 5-150 keV x-rays.The photons emitted come in discrete bands of energy corresponding to the material of the anode,and the undesired bands are removed.Choice of the anode and its emitted radiation energies depends on the application and the tissues being imaged,for instance molybdenum is often used in mammography because of its 20 keV x-rays.Too high radiation energies will result in poor pictures since the radiation cannot be readily attenuated,however too low energies will increase the radiation dosage of the patient without improvements in image quality. Sharpness of a radiographic image is strongly determined by the size of the x-ray source.This is determined by the area of the electron beam hitting the anode.A large photon source results in more blurring in the final image and is worsened by an increase in image formation distance.This blurring can be measured as a contribution to the modulation transfer function of the imaging system. These variables can be controlled by the operator but are more typically assigned automatically by the x-ray machinery through sampling the emitted radiation.Power generators convert standard 120 or 220 volt AC to higher DC voltages and typically employ rectified and filtered multiphase transformers which maintain a constant voltage and can be turn rapidly on and off for millisecond exposures. Photons images that have been shadowed from an imaging subject must be detected at high fidelity and resolution to allow for diagnosis.There are three main types of image detection methods used namely: film/screens,image intensifiers,and digital detectors,with the latter fast becoming the standard for x-ray image detection.The ability of an x-ray detector to produce high-quality images is determined largely by the modulation transfer function (MTF) and detective quantum efficiency (DQE) of the system. A Bucky-Potter grid may be placed between the patient and the detector to reduce the quantity of scattered x-rays that reach the detector.This improves the contrast resolution of the image,but also increases radiation exposure for the patient. X-ray film is almost always used in conjunction with an x-ray sensitive screen,because high resolution film is quite poor at detecting x-rays.These screens contain rare earth minerals and phosphor materials which convert x-ray radiation into visible light (of lower electromagnetic energy) to which the film is more sensitive.Screens generally have to have high resolution,good contrast,and a wide dynamic range,the last two being antithetic properties.The sensitivity of the screen inversely affects its resolution,since more sensitive screens are generally thicker causing more blurring as emitted light spreads out. The film's speed also plays a factor in image quality.Higher speeds are more sensitive to photons but are generally lower in resolution and more susceptible to noise.Lower speed films produce images of good resolution and dynamic range but require more photons for exposure and increase the radiation dosage to the subject. Image intensifiers are analog devices that readily convert the acquired x-ray image into one visible on a video screen.This device is made of a vacuum tube with a wide input surface coated on the inside with caesium iodide (CsI).When hit by x-rays material phosphors which causes the photocathode adjacent to it to emit electrons.These electron are then focus using electron lenses inside the intensifier to an output screen coated with phosphorescent materials.The image from the output can then be recorded via a camera and displayed. Digital devices known as array detectors are becoming more common in fluoroscopy.These devices are made of discrete pixelated detectors known as TFTs which can either work indirectly by using photo detectors that detect light emitted from a scintillator material such as CsI,or directly by capturing the electrons produced when the x-rays hit the detector.Direct detector do not tend to experience the blurring or spreading effect caused by phosphorescent scintillators of or film screens since the detectors are activated directly by x-ray photons.